Michael Essien (also referred to as Mickaël Essien) is a Ghanaian footballer who plays for Chelsea in the Premier League. Michael Essien is an all-round midfielder who can play multiple midfield roles (defensively and offensively). He has often been touted as a box-to-box midfielder for his ability to exert boundless energy in supporting offensive and defensive play. At Chelsea, his versatility as a player has been put to effective use in various roles. He has often been deployed as a defensive midfielder, but has also played as a centre midfielder, a right-sided lateral defender or a right-sided midfielder, even as a Right Back, and a Center Back. For the Ghana national football team, Essien has played primarily in a central midfield role, with combined opportunities to go forward or support defensive play. He also has a good eye for goal and has on occasion scored important, sometimes breath-taking goals for both club and country. One of his trademark abilities is to hit a shot from distance. Between the summer of 2007 and the summer of 2009, Essien was the most expensive African footballer on account of his £26 million move from French club Olympique Lyonnais to Chelsea FC. Essien is often referred to as "the Bison" for his tough tackling style, boundless energy and physical presence on the pitch. In July 2000, Essien was signed by French club Bastia. He did not immediately command a consistent place in the team, being deployed in various positions in the back four; however, because of an injury to one of his team-mates, he was given a temporary opportunity to play in central midfield, and flourished in this new role; he was even compared to Frenchman Patrick Vieira because of his ability to go from box to box. In the 2002–03 season, he helped Bastia to qualify for the UEFA Cup, scoring six goals that season. Soon, Paris Saint-Germain, Lyon and Marseille made offers for him. Paris Saint-Germain made Bastia the best offer and it was accepted, but Essien rejected PSG's contract offer, and instead agreed terms with Lyon, who paid Bastia €7.8 million for the transfer. At Lyon, Essien played more of a defensive midfield role, featuring regularly in the Lyon team that won the third and fourth of their ongoing string of consecutive Ligue 1 titles. He was also voted the 2005 Player of the Year by France's National Union of Professional Footballers (UNFP). He was also nominated for the 2005 FIFA World Player of the Year Award. He placed 22nd in 2005. On August 14, 2005, Lyon and Chelsea agreed a £26 million fee for the Ghanaian, finally ending one of the longest-running transfer sagas. At the time, the fee made Essien Chelsea's most expensive signing of all time, beating the £24 million they paid for Didier Drogba the previous summer. The transfer went through on August 19. The transfer came under scrutiny in the Stevens inquiry report, which expressed concerns because of the lack of co-operation from agents Pinhas Zahavi and Barry Silkman. He made his debut as a second half substitute against Arsenal on August 21, 2005, wearing the number 5 on his shirt. The game ended with a 1-0 victory to Chelsea. He made an assist in his full debut against West Bromwich Albion, and he replaced the injured Claude Makélélé in the defensive midfield role against Sunderland in the 2–0 win on September 10, 2005. He soon cemented his place in José Mourinho's side, starting in 31 domestic league games, and 11 appearances in the other cup competitions. On December 15, 2005, he was handed a two-match ban by UEFA for a controversial tackle on Dietmar Hamann, which resulted in his suspension from Chelsea's UEFA Champions League second round tie with eventual European champions Barcelona. Essien apologised to Hamann for the challenge - stating while he desires to be perceived as a player who "unsettles" opponents, he was not a malicious or an unsporting player. Hamann publicly accepted Essien's apology. In January 2006, Essien was himself stretchered off the field, after a challenge from West Ham United's captain Nigel Reo-Coker, and was sidelined for three weeks. 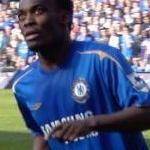 Essien scored his first goal for Chelsea in March 11, 2006, in a 2–1 victory over Tottenham Hotspur. His second goal came on April 17, 2006, against Everton with a powerful strike after an assertive burst through the defensive line. Essien ended his maiden season in England with two goals, both in the Premier League. Essien was nominated for the 2006 FIFA World Player of the Year Award on October 12, 2006 where he placed 22nd. One week later, he was nominated for the 2006 Ballon d'Or. He was voted as the Best African Footballer of the Year in 2006, a feat he achieved in 2005 as well. He won the 2006 BBC African footballer of the year award. The following season Essien scored several important goals including his first UEFA Champions League goal for Chelsea in a 2–0 victory over Werder Bremen of Germany on September 12, 2006. Later in the competition, Essien scored a late winner in the quarter-final second leg against Valencia at the Mestalla to send Chelsea through to the semi-finals with a 2–1 victory on the night, and 3–2 win on aggregate. It was his first match back in the team after several weeks out with a knee injury. Essien also scored a stunning late equaliser at home against Arsenal on 10 December, 2006, as the game was going to end Chelsea's long unbeaten run. On May 15, 2007, Chelsea fans voted Essien as Chelsea Player of the Year for his contributions in the 2006–07 season, becoming the first African to receive the honour. His late dramatic equalising goal against Arsenal was also voted as Chelsea Goal of the Season for 2006–07. On August 13, 2007, Essien grabbed the winner with his first goal of the 2007–08 Premier League campaign, as Chelsea defeated Birmingham City, to set an English record for unbeaten league matches at home – eclipsing Liverpool's previous top-flight record of 63 set between 1978 and 1981. On October 10, 2007, he was nominated for the prestigious 2007 FIFA World Player of the Year Award for the third consecutive year and on October 21, 2007 Essien was also nominated for the 2007 Ballon d'Or Award for the third consecutive year as well. He was voted 15th Best Player in the World at the 2007 FIFA World Player of the Year Awards. On December 12, 2007, Essien was nominated for the 2007 African Footballer of the Year a third consecutive time he had been nominated. He was Runner-up to that year's winner Frédéric Kanouté. On July 22, 2008, Essien signed a new five-year deal with Chelsea, keeping him at the club until 2013. It was feared Essien would miss the 2008-09 season after sustaining anterior cruciate ligament damage on September 5 whilst playing for Ghana. However, on March 7 2009, he came on as a substitute in the second half of the FA Cup game against Coventry City. In his second game back from the knee injury, just before half time, Essien scored to give Chelsea a vital away-goal versus Juventus in the Champions League round of 16. Chelsea went on the draw the match 2-2 and through to the quarter-finals 3-2 on aggregate. He made his first league start from injury against Manchester City, and scored the only goal in the match. On May 6 2009, Essien scored a stunning left-footed volley in the second leg of the Champions League semi-final against FC Barcelona, a tie which Chelsea ultimately lost due to the away goal rule, controversially after 4 penalty appeals were rejected. The goal was later voted 2008-09 goal of the season by the Chelsea fans. In the 2009-2010 season Essien put in an excellent performance against Blackburn on the 24th October 2009 and scored his first goal of the season with a swerving 35-yard shot on 52 minutes. He scored his first brace for Chelsea against Wolves with a header and a low shot from outside the box, and came close to completing his first hat-trick for the club with a flurry of second half shots, one of which was tipped onto the bar by Wolves goalkeeper Wayne Hennessey. Essien was injured on international duty during the 2010 African Nations Cup and is expected to miss the rest of the English domestic season. Essien's International career started with the Ghana U-17 National team, the Black Starlets, when he played in the 1999 FIFA U-17 Championship in New Zealand and won the Bronze medal. In 2001, even though he was one of the youngest players in the tournament, Essien took part in the 2001 FIFA World Youth Championship with the Black Satellites in Argentina. The Satellites finished runners-up to hosts Argentina. His exceptional performances captured the attention of many and was widely tipped to be one of Africa's next rising stars. He made his competitive senior debut in the 2002 African Nations Cup against Morocco on 21 January, 2002 but had played for Ghana in a Pre-Tournament friendly against Egypt on January 4, 2002. On May 16, 2006, Essien was selected to be part of the team that represented Ghana at the 2006 World Cup in Germany. He played in midfield with team captain Stephen Appiah formerly of Fenerbahçe and Sulley Ali Muntari of Internazionale. Essien played in Ghana's 0–2 defeat to Italy, their 2–0 victory over the Czech Republic, and the 2–1 victory over the United States, and helped Ghana become the only African team to reach the second round of the 2006 World Cup. However, Essien was suspended for Ghana's second round match against Brazil and could only watch as Ghana lost 0–3. Upon the team's return to Ghana, Essien said that the team had gained invaluable experience and will be aiming to make the next finals, which will be held in Africa for the first time in the tournament's history at South Africa 2010. In the 2008 African Cup of Nations Essien turned in another brilliant performance, driving the team to the semi finals with his power-packed performances. In the quarter-final against Nigeria, when team captain John Mensah was dismissed on the stroke of the hour for a professional foul on Nigeria's Peter Odemwingie, Essien took over the captaincy for the rest of the game and eventually won 2-1. He was voted as an All-Star Player during the 2008 African Cup of Nations Tournament in Ghana. The Team of the Tournament was decided by the Technical Study Group (TSG) after careful observations of all the tournament's matches. During an international match played against Libya on September 5, 2008 Essien ruptured his anterior cruciate ligament playing for Ghana in the World Cup qualification stage and was out of action for 6 months, missing the majority of the 2008-09 season, before returning on March 4 to play for Chelsea Reserves against Aston Villa Reserves. He scored the last goal in the 4-3 loss. He still managed to take part in 10 of Ghana's 11 qualification matches, clocking up more than 800 minutes of game time, as Ghana finished at the top of their group and have automically sealed a spot at the World Cup.